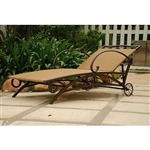 Outdoor Patio Chaise Lounge Chairs recline to multiple positions and are great for patios, outdoor area, pools, and decks. Folding lounge chairs with matching ottomans. Modern lounge chair and recliners add style to your pool or patio area.